Marubeni Corporation (丸紅株式会社, Marubeni Kabushiki-gaisha) (TYO: 8002) is a Japanese trading company and one of the largest sogo shosha, (general trading companies) in Japan. Marubeni has 12 business divisions: agri-marine products; chemicals; development and construction; energy; finance, logistics, and new business; forest products and general merchandise; information and communication; metals and mineral resources; plant and ship; power projects; textiles; and transportation and industrial machinery. 1.2 C. Itoh & Co.
1.11 "Wintry period for trading companies"
Marubeni's name combines the Japanese words for "circle" and "red." It was founded, in 1858, from humble beginnings. Company founder, Chubei Itoh, began the company by peddling Ohmi linen on a market circuit. In 1872, he opened a wholesale drapery store, "Benichu," in Osaka, and gradually expanded into foreign trade with commercial goods. His son, Chubei Itoh II, brought a practical and international outlook to the business. Itoh II studied in England for one year and developed a new business model. Itoh II purchased directly from manufacturers instead of through foreign trading houses. He then developed the company further by the use of low-interest local capital to finance exporting products from Japan to several other countries. Marubeni continued expanding its trade into many industries and like most others, benefited when demand for its products was increased by economic expansion, and weathering economic downturns. 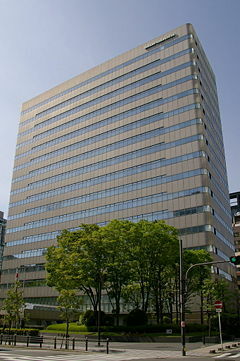 There are 120 Marubeni Group offices worldwide with more than 500 associated companies. Chubei Itoh (1842–1903), the founder of Marubeni was born in what is now called Toyosato-cho, Inukami District, Shiga Prefecture, the second son of Chobei Itoh. From an early age he was involved in the family trading business, making his first business trip when he was eleven years old with his brother Manjiro, to sell goods in the town of Goso in Houzuki Village. Marubeni considers itself to have been founded in 1858, when Chubei began peddling Ohmi linen, following the mochikudari system. Chubei traveled a regular circuit of market towns, taking orders with a sample book and having the goods delivered by express messenger to a designated inn. The following year he observed the foreign trade activity in Nagasaki and determined to open his own trading business at the earliest opportunity. In 1861, Chubei joined the Eiku trade association of Ohmi merchants who took drapery and cloth goods to Kyushu, and later became a representative of this organization. At that time it was fashionable to open shops in Kyoto, but in 1872, Chubei challenged convention by opening a drapery shop, Benichu, a drapery shop, at Motomachi 2 chome in Osaka. That same year, Chubei's older brother, Chobei Itoh opened Itoh-chobei Shoten, a drapery wholesale store in Hakata, Kyushu. Chubei divided his profits equally between providing for his family, building his business and paying his employees. He loved freedom and rationality, telling his staff that "prosperity can only be found where true liberty lies." and encouraging younger staff to openly voice their opinions at regular in-house meetings. He hosted sukiyaki parties with his staff each month on days ending on a "1" or a "6," and regularly organized social events for them to attend plays or sumo matches. In 1883, Chubei began to use the “Beni” character as the store's logo. In 1884, Chubei changed his store’s name to Itoh Honten (headquarters), and opened Itoh Kyoto Store, a drapery wholesale store in Kyoto. In 1885, he formed the foreign trading company "Itoh Sotoumi-gumi" with Tetsujiro Sotoumi, steadily expanding the business to trade in general merchandise of many kinds. Later he opened Itoh West Store, a woolen fabric import and wholesale store, in Osaka, and the Itoh Itomise (Thread and Yarn Store), and other enterprises. He served as the headman of Toyosato Village (now Toyosato Town) until his death in 1903. Chubei Itoh was succeeded by his son, Chubei Itoh II. The beginning of the Russo-Japanese War in 1904 created a sudden demand for cotton in Japan, causing the industry to develop dramatically. Itoh Honten rapidly developed its overseas trade, setting up an export department in 1904, a Shanghai office in 1906 and a branch office in Gyeong-seong (Seoul), Korea in 1907. In 1908 the four businesses and one factory previously run by different branches of the Itoh family were consolidated into one company, with Chubei Itoh II as the managing director, and opened a Tokyo branch. The export department was set up as a separate business with the name of Itoh Exports, opened branch offices in Hankou and Manila, and established a joint venture called ‘Kyoekisha’ using local capital in Korea and China. In 1909–1910, Chubei Itoh II went abroad to study in England, visiting the U.S.A. on his way. While in England, he gained experience as a businessman and formulated new trading methods that became the basis of Marubeni today, such as trading directly with businesses in the U.K. rather than through the foreign trading houses to gain more profit for Japan, and making use of low interest rates in the U.K. to finance importing. Chubei Itoh II’s international outlook and practical approach to business were the key to Marubeni’s growth into a major international corporation. In 1914, the Company was reorganized from a proprietorship into C. Itoh & Co. In 1918, the limited partnership was divided into Itochu Shoten Ltd. with the Main store and Kyoto store at its center, and C. Itoh & Co., Ltd. with the yarn store and the Kobe Branch at its center. These two companies were the forerunners to Marubeni Corporation and Itochu Corporation, respectively. In the wake of World War I (1914–1918) and the Great Depression, the commodity market plummeted, bankrupting many companies and banks, and Itochu Shoten Ltd. and C. Itoh & Co., Ltd. also suffered large losses. In response, C. Itoh & Co., Ltd. spun off its trading division, which was the Kobe branch, and its overseas branches, into Daido Boeki Kaisha Ltd. In 1920. Daido Boeki opened new branches and offices in several countries, such as the Philippines, China, Indochina, and Indonesia, and grew steadily by handling textiles, sundries, linen, rubber, and other products. In March 1921, Itochu Shoten merged with Ito-chobei Shoten to form Marubeni Shoten Ltd. At that time the company had only one branch in Kyoto, and was at best a textiles wholesaler, handing silk and wool fabrics. As Japan entered the Showa Era (1926–1989) there was a revolution in women’s fashions, from Japanese style to Western style. From 1924 onwards, Marubeni Shoten Ltd. traded in processed cotton, which increased in importance each year until it became the principal export product. Kureha Cotton Spinning was founded in 1929. Marubeni Shoten Ltd. increased its trade in raw materials such as cotton, rayon and rayon yarn, central to the development of the Japanese textile industry, and became a major textile trading concern. In 1931, the Osaka branch was established, concentrated on trading, and eventually Marubeni Shoten Ltd. opened branches and offices throughout China and in India and expanded its trade to include construction materials, machinery, sundries, food products, and other materials in addition to textiles. In 1937, the Osaka branch's sales exceeded those of the Main store, accounting for 62 percent of overall sales. Branches were opened in Calcutta, Semarang, Bangkok, Bombay, and New York, and an international network of representatives operated in South America, Africa, and Australia. As the business performance of Marubeni Shoten, C. Itoh & Co., Ltd., and others recovered, the move to unify all of the Ito family business strengthened. In September 1941, the three companies of Kishimoto Shoten Ltd., a steel trading company for which Chubei Itoh served as an officer, Marubeni Shoten and C. Itoh & Co., Ltd., were merged to form Sanko Kabusiki Kaisha Ltd. Soon after, however, World War II erupted in the Pacific, resulting in strong economic regulation, which made conducting company activities difficult and limited trading to China and Southeast Asia. In September 1944, the three companies of Sanko, Daido Boeki, and Kureha Cotton Spinning Co., Ltd. were merged to form Daiken Co., Ltd. It had 103 affiliated companies inside and outside of Japan. The production division alone was involved in 16 different major company groups; the commercial division handled shipping and delivery of textiles, heavy industry, chemical industry products, grains, and fertilizer; and also provided materials to the military. When the war ended soon afterward, the company lost all of its overseas assets. When the war ended in 1945, Daiken had more than 5,000 employees. Of these, approximately 2,200 were military personnel or were involved in military work, and approximately 1,000 people were in China and Southeast Asia. These people were brought back to Japan after the war, but many of them had to be laid off due to the economic recession in Japan. In February 1948, Daiken was identified as subject to the Law for Elimination of Excessive Concentrations of Economic Power, one of the measures to break up the Japanese zaibatsu (large holding companies). It was divided into the four companies of Marubeni Co., Ltd., C. Itoh & Co., Ltd., Kureha Cotton Spinning Co., Ltd., and Amagasaki Nail Work Ltd.
On December 1, 1949, Marubeni Co., Ltd. was established based on the commercial supremacy and employees of the old Marubeni Shoten, Daido Boeki and Kishimoto Shoten, with Shinobu Ichikawa from Marubeni Shoten as president. The new company was capitalized at ¥150 million, had 1,232 employees, and used the old Marubeni Shoten building in Motomachi 3 chome, Higashi Ward, Osaka as its headquarters. The company had two branches in Tokyo, and other branches in Kobe, Kyoto, Nagoya, Hiroshima, Fukui, Kokura, and Yokohama, but not a single overseas office. On December 1, 1949, Japanese private companies were allowed to export; in January 1950, imports were liberalized. The first fiscal year (December 1949 to March 1950) Marubeni Co., Ltd. had sales of ¥5 billion, 80percent of which were from textiles, so the Company was a textile-centered trading company. The start of the Korean War in June 1950, created an extraordinary demand that improved market conditions, resulting in a dramatic increase in sales, ¥50.6 billion for fiscal 1950. When an agreement was reached in the cease fire talks in 1951, the markets for textiles, soy beans, rubber, and leather collapsed, causing big losses, and forcing the company to ask for help from banks and spinning companies. Marubeni’s first overseas office was established in New York in April 1951, and in November of the same year Marubeni Company (New York) Inc, was established as its first overseas subsidiary. Other offices were established in Karachi and Portland in 1951, followed in 1952 by offices in London, Singapore, Mexico, Manila, Hong Kong and other cities. By the end of 1954 the company had 22 overseas subsidiaries and numerous overseas representatives, making it a true trading company. As the Japanese economy expanded, Marubeni’s sales grew to ¥134.9 billion in 1953, and its capital reached ¥1.5 billion in February 1955. In 1955, Iida & Co., Ltd., which had sustained a large loss from the collapse of the soybean market, sought a merger with Marubeni, in accordance with a government policy ot strengthen trading companies. On September 1, 1955, Marubeni and Iida merged to form Marubeni-Iida Co., Ltd. Marubeni profited from Iida & Co., Ltd.’s strong position in the domestic steel trade, and its dominance in the wool, leather, machinery, and fuel trades. Marubeni-Iida established a chemicals department in 1957, and mediated the transfer of polyethylene production technology from the United States to Showa Denko. In 1958 it actively pioneered new business fields, such as the start of automobile exports to the United States by Nissan Motors, which greatly expanded the sales of machinery and other products handled by the non-textile division. Sales in 1965 reached ¥1.1351 trillion, and the company employed 5,943 workers in more than 70 companies in Japan alone. In April 1966, Marubeni merged with Totsu Co., Ltd., a trading company specializing in metals and a sales agents for Nippon Kokan K.K. (now JFE). The merger with Totsu created a close relationship between Marubeni-Iida and NKK and doubled the sales of Marubeni-Iida's previously weak metals division. During the second half of the 1960s, when Japan's real economic growth exceeded 10percent, the country's industrial output, such as steel and automobiles, increased rapidly, creating a growing demand for raw materials. In response, Marubeni-Iida began developing a variety of businesses that are now the core of the company, such as importing iron ore from Australia and raw coal from Canada; constructing a pulp plant in Canada; operating salt fields in Australia; forming a textile joint venture in Thailand; establishing an automobile sales company in Belgium; and constructing a steel distribution processing center, grain silos, chemical tanks, and high-rise condominiums in Japan. After the merger with Iida in 1955, Marubeni-Iida had a close relationship with Fuji Bank, leading to the formation in 1960 of Fuyo Development Co., Ltd. (now Fuyo General Development and Finance Co., Ltd.), with 17 other companies including the Fuji Bank, NKK, Showa Denko, and Taisei Corporation. In 1966 the Fuyo Conference, consisting of the presidents of Fuyo Group companies was formed, and Fuyo Air Services Co., Ltd. (1968) and Fuyo General Lease Co., Ltd. (1969) were established by its member companies, including Marubeni-Iida. On January 1, 1972, the company changed its name from Marubeni-Iida to Marubeni Corporation. 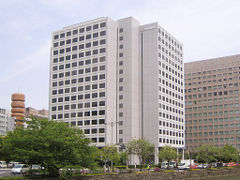 During the same month, the office of the Tokyo headquarters was moved from the Otemachi Building to the newly constructed Marubeni Building at Takebashi Station in Tokyo, which is still the headquarters office building today. In July, 1973, the Company merged with Nanyo Bussan Co., Ltd., a trading company specializing in non-ferrous metals, and acquired its interests in copper ore imports. In August 1971, alarmed by its growing trade deficit ("Nixon Shock"), the United States ceased the conversion of dollars to gold and established import surcharges. The major world currencies from a fixed exchange rate system to a variable exchange rate system, causing the yen to strengthen. The Japanese government, worried about a strong yen recession, implemented aggressive fiscal support, easier financing, and a low-interest-rate policy. This, coupled with a rise in grain prices due to poor weather overseas and a rise in the price of crude oil when the Yom Kippur War broke out, caused runaway inflation in Japan. The mass media blamed the trading companies for the price increases, accusing them of cornering the market or hoarding. Until that time, the general trading companies had admired as Japan's economic pioneers for developing overseas markets and investing in new businesses, but as sales grew to several trillion yen, they were criticized for their sheer size. As the Japanese economy became massive, the growth slowed and the emphasis changed from heavy industry, such as steel and heavy equipment, to light industry, such as electronics. In February 1976, Marubeni’s credibility was damaged when it was implicated in a scandal involving the sale of Lockheed's wide-bodied Tri-Star passenger plane to Japan's largest domestic carrier, ANA. Lockheed contracted Marubeni to act as its representative in the multi-million dollar negotiations. The former vice-chairman of Lockheed, Carl Kotchian, testified that a Marubeni official made arrangements for Lockheed to pay US$300,000 (US$50,000 for each of six planes originally ordered) to the president of the airline, as well as US$100,000 to six government officials, in accordance with "Japanese business practices," to secure the contract. By July 1976, prosecutors had arrested nearly 20 officials of Marubeni and All Nippon Airways. The scandal nearly brought down the Japanese government. The case directly contributed to passage of the Foreign Corrupt Practices Act (1977) in the United States, which forbids U.S. companies from making payments to officials of foreign governments for the purpose of obtaining or retaining business. Marubeni was seriously damaged by the public image resulting from the scandal; more than 40 municipalities canceled contracts, and several international ventures were terminated. The company implemented a reform of its management structure, distributing many of the president's administrative responsibilities to a board of senior executives and adding checks and balances at the executive level. Marubeni recovered quickly and by 1977, its trading volume was double that of 1973. Marubeni consolidated its international trading network and expanded its business in the United States, Australia, Brazil, Britain, West Germany, and Sweden. Marubeni also opened or expanded offices in the Soviet Union, the People's Republic of China, the Middle East, and Africa. In the early 1980s Marubeni was involved in the development of coal mines in the United States and Australia, a copper mine in Papua New Guinea, and nonferrous metal mines in Australia and the Philippines. "Wintry period for trading companies"
During the first half of the 1980s Japan's real economic growth remained around a low 3percent, and the country faced the problem of disposing of overcapacity, especially in the materials industry. The strong yen decreased export profits, leading manufactures to reduce the commissions paid to trading companies or bypass them altogether and directly export their own products. Increases in expenses and labor costs, and the poor performance of subsidiaries and affiliates, increased the trading companies’ difficulties, and the period came to be called the "wintry period for trading companies." In December 1982, a Vitalize Marubeni (V.M.) initiative to strengthen business fundamentals and improve profitability was implemented, but the company suffered costly write-offs from the reorganization of its subsidiaries, and was forced to rely on income from the sale of stock. The businesses that did expand during this period were plant exports for power systems, energy, chemicals, and exports of steel pipe for oil producing companies. Orders for power systems from around the world were a major source of profit from the 1980s through the first half of the 1990s. After the “burst of the Japanese bubble” in the 1990s, Marubeni suffered a large write off, and the drop in price of bank and other stocks caused the company to post a net loss in 1997 of ¥30.8 billion, the company's first loss since fiscal 1951. Despite this difficult business environment, Marubeni actively developed businesses, such as developing and importing LNG from Qatar, purchasing a pulp plant in Canada, entering the electric power generation business, entering the information and telecom businesses, such as laying fiber optic submarine cables to Europe and the United States and the Internet, and establishing many business corporations in China and Southeast Asia. On October 1, 2001, Marubeni-Itochu Steel Inc. was incorporated, the first entity established by general trading firms integrating their common business operations. In November 2001, as the economic situation suddenly changed after the sharp decline in stock prices in Japan, the bursting of the dot-com bubble, and the September 11, 2001 attacks in the U.S., Marubeni’s consolidation efforts resulted in a massive deficit of ¥116.4 billion. The company’s performance was evaluated negatively by the media and stakeholders, and the stock price temporarily plummeted below the 60-yen level in December 2001. By 2002, the company was able to record a consolidated net profit of ¥30.3 billion. By 2006, consolidated net profit amounted to ¥119.3 billion. Today there are 120 Marubeni Group offices and more than 500 associated companies worldwide. Marubeni America, the largest overseas subsidiary of Marubeni Corporation. has its headquarters in New York City, with 7 other U.S. locations and more than 30 subsidiary and affiliated companies. It is a "sogo shosha" (general trading company), acting as an intermediary in all types of trade. It relies on human resources, intensive information gathering and financial resources, and has few fixed assets. Marubeni America independently trades in a broad range of commodities, agricultural goods, industrial machinery and natural resources, as well as serving as financiers and large-scale organizers for the global movement of products. It provides specialized services, including sales support, logistics planning, insurance, storage, financing and leasing, and engineering and construction services, and sometimes makes direct investments. ↑ Itochu Group, Chubei Itoh Retrieved October 8, 2008. ↑ Answers.com, Marubeni Corporation. Retrieved October 9, 2008. ↑ Marubeni USA, Homepage. Retrieved October 8, 2008. Fujiki, Ryuzo. The Role of Japanese General Trading Company and Its Strategy. 1977. Ishikawa, Akira, and Tai Nejō. Top Global Companies in Japan. Singapore: World Scientific, 2004. ISBN 9789812563040. Kojima, Kiyoshi, and Terutomo Ozawa. Japan's General Trading Companies: Merchants of Economic Development. Development Centre studies. Paris: Development Centre of the Organisation for Economic Co-operation and Development, 1984. ISBN 9789264126442. Marubeni Corporation. Business Bulletin Marubeni. Tokyo: Marubeni Corporation, 1900. Marubeni Corporation. The Unique World of the Sogo Shosha. Tokyo: Marubeni Corporation, 1978. Picken, Stuart D. B. Historical dictionary of Japanese business. Historical dictionaries of professions and industries, 1. Lanham, Md: Scarecrow Press, 2007. ISBN 9780810854697. Roehl, Thomas W., and Allan Bird. Japanese Firms in Transition: Responding to the Globalization Challenge. Advances in international management, v. 17. Amsterdam: Elsevier JAI, 2004. ISBN 9780762311576. All links retrieved August 28, 2018. This page was last modified on 28 August 2018, at 14:59.